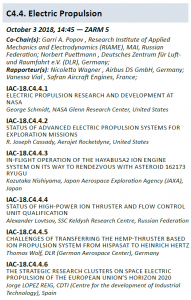 The International Astronautical Congress (IAC 2018) was held during 1-5 October 2018 in Bremen (Germany), and EPIC and the SRC activities were present with a paper with their latest developments. The International Astronautical Congress (IAC) is organized by the IAF, and is recognized to be the most important international forum for space of the year. For more details on the IAC 2018 visit the IAC 2018 webpage were the programe, technical sessions, calendar, activities and practical information can be consulted. 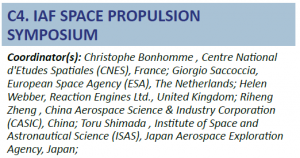 Other European electric propulsion papers were presented in this session with their latest EP developments. 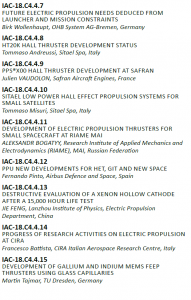 The IAC 2018 is a perfect dissemination event to present to the international space community the Electric Propulsion SRC activities and latest developments from all OGs partners; and it was a great moment to strength the good collaboration and team spirit inside the European electric propulsion community. The common objective is clear: develop the European electric propulsion technology and its competitiveness and innovation, supported by the European Union in the frame of the Horizon 2020 Electric Propulsion SRC.